This boy got to grow up; the Nationwide boy not so much. These thoughts are seriously deep. Don't jump in unless you're sure you can swim. So the debate continues over the Super Bowl ads. Which were the losers? In his essay on TV ads and plucked heartstrings in the Tribune, Chris Jones names a couple of the usual suspects, the Nationwide insurance ad with its dead child, and the McDonald's ad where the food's on the house if you pause in your busy day to do something loving. Jones accuses McDonald's of "overreaching" and making viewers nervous. "I'd rather just pay than call my mom at the counter to get a free lunch. Wouldn't you?" he says. I suppose so, but by this line of logic no one will ever buy Bud Light again, lest he suddenly find himself fleeing from Blinky, Pinky, Inky, and Clyde as a mob shrieks with glee. I don't expect that, and I don't expect my next Big Mac will be on the house. It takes a certain credulity to address these ads as important transactional experiences. They succeed if they sell product, and all we're doing now is guessing. And here's a piece in the New York Times based on a conversation with the composer-performer Lin-Manuel Miranda. Writes Rob Weinert-Kendt, "Mr. Miranda, who won a Tony for the score of 'In the Heights,' was holding forth on Alexander Hamilton, the nation's first treasury secretary, who is the unlikely subject of his new musical, 'Hamilton,' now in preview at the Public Theater." Was it unlikely that someone would write a hip-hop musical about Alexander Hamilton? I certainly wasn't holding my breath. But given the existence of a new musical called "Hamilton," is it unlikely that Alexander Hamilton is its subject? I hardly think so. Weinert-Kendt's fallacy is so subtle I wonder if it even has a name. Actually, I wonder if it's even a fallacy. Fortunately, because there's no Super Bowl, I've got the rest of the day to think this through. Lastly, I came across, in the Times, an essay weighing Richard Linklater's Boyhood against Michael Apted's Up films, which have followed a group of Britons at seven-year intervals from the age of seven to the age of 56, with more installments to come. Putting Boyhood in its place, Mary Jo Murphy refers to critics' "nearly unanimous" praise then comments, "It's hard to imagine that critics would have deployed such superlatives had the actors simply been aged by the application of makeup or other cinematic artifices in the service of the same threadbare story." Threadbare? Says the dictionary, "meager, scanty, or poor." Also, "hackneyed; trite; ineffectively stale." I hope Murphy doesn't mean that. I hope all she means is that Boyhood doesn't have much of a plot. Mason grows up and goes to college. Meanwhile, his parents lead their lives, which aren't what either one of them hoped they'd be but aren’t disasters either. Murphy to Boyhood—yeah, OK, whatever! But I think Linklater has one more movie to make about Mason. 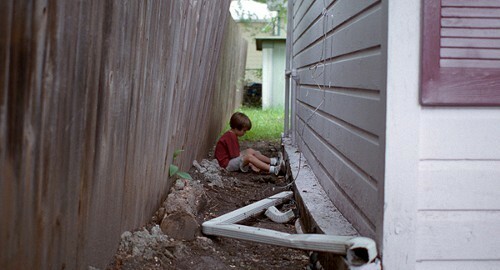 In Boyhood we see Mason develop a knack for photography. We can't see into his future, but if he gravitated to cinema it would come as no surprise. So let's check in on him in ten years, when he's a young director making his first movie, which is highly biographical and attempts to transmute the quotidian growing-up experiences we remember from Boyhood into a powerful coming-of-age drama. Without realizing it, Mason will be trying to give Murphy what she wants. His film's earnest pretensions will make us wince.